Perfect stay! The staff were super helpful and gave us advice every day about where to go, eat, and about transportation. We felt very safe with the multiple keys to get up to our room. Location is perfect, only a 10 min walk to Coleseum. If you're a healthy, young adult you can actually walk to every main attraction without taking the subway (Trevi Fountain, Spanish steps etc). Everything was super clean and comfy room. Would definitely stay again if we return. I was so impressed with Sole e Luna! The staff were friendly, the room was clean (and I'm very picky), there's free wifi and the location was perfect! It's just a few blocks from the metro, but if you like walking, it's perfect. The colosseum is a five to ten minute, the Roman Forum and Trajan's Column are just past that, then we walked to the Pantheon, the Trevi Fountain and the Spanish Steps before catching the metro back. For late night food/drinks go to Royal next to the Colosseum. 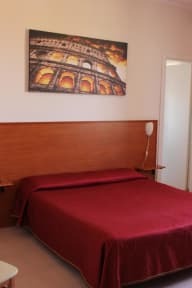 Lovely rooms in a quiet block a short walk into the main attractions of Rome. The rooms opening onto the courtyard are particularly peaceful. Breakfast is sugared croissants and jams - no fruit or savoury options but there is a fridge in the room if you want to stock up on alternatives. Staff very helpful with recommendations for day trips and eating out (our highlight for dinner was Luzzi restaurant- cheap and great food). Card machine was not working so we had to pay in cash. Allan and Laura are great host. Highly recommend. Bed uncomfortable. Everything good minus the bed. The walls are very thin. Perfect location and clean, comfortable rooms. 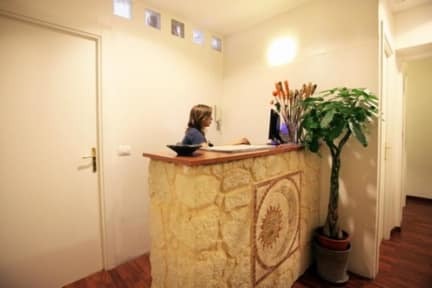 The staff was very helpful and communicated often to arrange arrival times and check in. Very pleased with our experience absolutely would stay again! Great location. AC is €5 extra otherwise nothing to complain about. Breakfast is simple but nice with the room service! Really nice guy at the receotion, unfortunately not always available. The location is really good, many tourist spots in walking distance. We had some problems with the Wi-Fi. All in all a nice B&B.